I’ve been living in southern California for a few months now, and I’ve got to say, some days are hot and dry as hell. Since I’ve been sporting my beard longer than usual this summer, it’s become extremely susceptible to the the elements. Five minutes after any shower or workout and my facial hair would turn into an unkempt wire brush. After trying a couple dozen beard balms and beard oils, I gave the brand new Uppercut Deluxe Beard Balm a fair shake. I’ve been familiarized with the Uppercut Deluxe hair styling products, namely the Uppercut Deluxe Pomade, through my new neighborhood barber. A truly great pomade if you’re after a very strong hold that lasts and only takes a dime-sized amount to do the trick. When I heard about the launching of the brand’s beard balm, it definitely piqued my interest. First things first: the smell. The scent of Uppercut Deluxe grooming products is phenomenal. It’s a mix of a lot of coconut with a little bit of vanilla, which are two of my personal favorite smells. A lot of other brands tend to go for more woodsy scents, which can be a bit overdone. This smell will immediately invade your nostrils and stay with you the whole damn day. It’s quite soothing too. If coconut or vanilla isn’t your thing, I don’t know what to tell you. 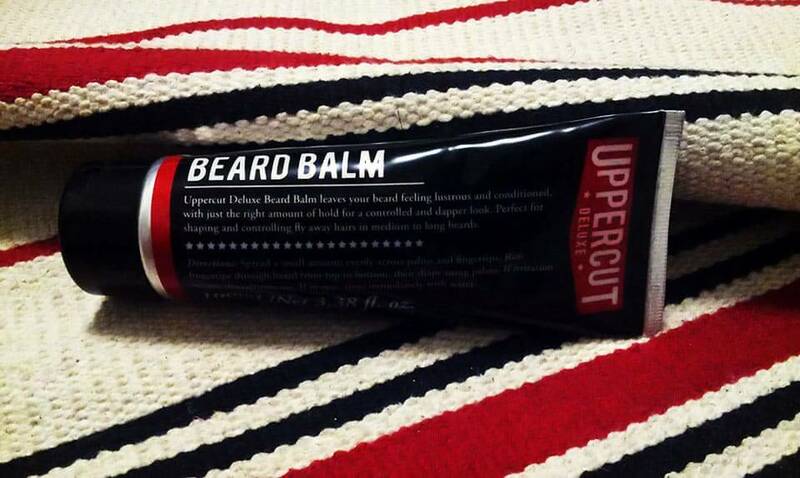 Uppercut Deluxe Beard Balm is certainly not your standard beard balm. For one, it’s water-based rather than beeswax-based. It’s not hard and waxy and thus does not require any heat to make workable. As a matter of fact, it comes in the type of tube you squeeze your toothpaste out of. You simply squirt a pea-sized droplet into your palms (for a medium length beard) and begin working it into your facial hair. The actual amount of beard balm required will vary based on the size of a beard, but I’ve found that a little goes a long way with liquid grooming products vs. waxy grooming products. Don’t expect a strong hold. While Uppercut Deluxe may be reputed for their strong-hold pomades, this beard balm should not be held to the same standard. It’s not wax based and won’t harden your facial hair. What it will do is make your stiff and wiry beard more manageable and comb-friendly, but it’s certainly not going to help you style your beard in the same manner as beard wax or traditional beard balm containing beeswax. For this simple reason, I tend to interchange it with my beard oils rather than my other beard balms and reach for another option when I need to style the beard a bit. 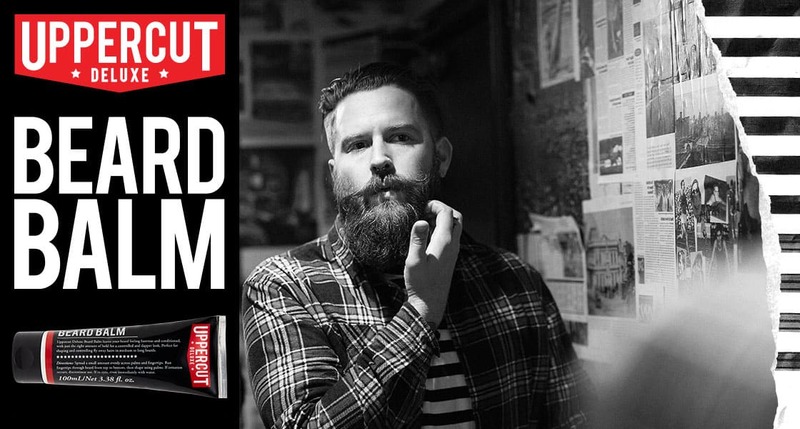 Uppercut Deluxe Beard Balm, the thunder from down under, is an Aussie creation. It contains aqua, cetearyl alcohol, ceteareth-20, glycerin, PVP, glyceryl stearate, cetrimonium, PEG-100 stearate, phenoxyethanol, caprylyl glycol, guar hydroxypropyltrimonium chloride, fragrance (parfum), coumarin, citric acid, and tetrasodium EDTA. You’ll notice as the main ingredient that the balm is water-based, making it more runny than your traditional hard and waxy beard balms. A 3.38 fl oz (100mL) tube of Uppercut Deluxe Beard Balms comes very modestly priced at only $18 at UppercutDeluxe.com. This is right in the lower to middle of the pack cost-wise. It’s very different from your traditional beard balms so I’d definitely add this to the grooming cabinet, if only just to try it and compare with other beard balms.